Throughout the year I always try and offer my services to charitable functions, worthwhile causes and sponsored events. My chosen charity for this year is once again Wishes 4 Kids, a fantastic Leicester based charity that aims to grant a wish to terminally ill and life limited children. This charity has a very special place in my heart and ANY fundraising you could do for them would be greatly appreciated. Please take a look at their website, and if you can do anything to help, from the smallest donation to organising an event, then please do so! If you'd like to organise a magical themed evening for your local society or social group to raise money for Wishes 4 Kids, or hire a magician for your charity event, then please contact me! I would just like to say a very big 'THANK YOU' to you for entertaining all of our family and friends at Amy's 21st Birthday Party on Saturday 10th September at the Manor Hotel. Everyone said how fantastic you were and are still talking about you today. You really did make the evening very memorable and I am so glad I chose you from all the other mix and mingle magicians. Already somebody has asked me for your contact details and I will certainly be recommending you to everyone else I know who is getting married or having a private party. Once again, thank you Carl. Hope to see you again in the future - this time as a guest not as a host so that I can take more of the magic in! P.S - My friend would like to book you just for looking like Peter Jones off of Dragons Den ha ha! We’d both just like so say a HUGE thank you for entertaining our guests, and us, on our wedding day last month. From our first phone call to you your professionalism shone through, which was highlighted on our wedding day when you kept 100 of our guests mesmerised, and laughing, whilst we were having our photos taken. It's obvious you have a natural 'way' with people! A number of our family and friends have already asked for your details, and I will have no hesitation in recommending you to anybody who is looking for some great entertainment in the future. Thanks again! Just wanted to drop you a message to say a massive thank you for providing excellent magic and entertainment for our staff summer party. It was a great success and staff are still talking about your crazy tricks and trying to figure them out! You certainly pleased the crowd, and we all enjoyed having you be a part of our day and have some great pictures! Hopefully you’ll be available for our next year’s event, and in the mean time we will highly recommend you! What can I say?? WOW! Your performance at my birthday party last weekend was absolutely brilliant.. my mum has only just stopped laughing at you (in a good way!!) And your card tricks were amazing! If you are looking for a fantastic wedding photographer for your big day then look no further than Stuart James photography. I had the privilege of working with Stuart at a recent wedding, and his photo's were fantastic... many of which are now featured on this site! I have recently had the privilege of working with former Leicester City captain Steve Walsh at a number of weddings and corporate events across the midlands. Steve is the managing director of Legends UK, a Leicestershire based company specialising in sporting events, memorabilia and football coaching, as well as organising sporting dinners, question and answer evenings and golf tours. If you're looking at organising an event in the near future then I would fully recommend taking a look at Steve's website and see what that have to offer. I met Jo and David at a wedding I was performing at in Leicester on Saturday, and their professionalism shone through... plus they got some FANTASTIC shots! Here we are in the middle of July, so I’d imagine the thing most on your mind now is Christmas! Well believe it or not I’m already taking bookings for Christmas parties throughout December, as well as new years parties and even a couple of weddings. More and more people are hiring a magician for their Christmas Party, and it can add a really unique element to your celebrations. 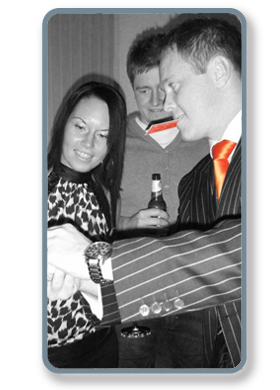 Close up magic is a fantastic form of entertainment, so why not consider it for your event? If you’re looking for a magician in Leicester, or anywhere else in the UK, for your Christmas Party or wedding, contact me for a quote or a no obligation chat and see how a close up magician can fit into your day! I would just like to say thank you for making our Student Pharmacy Ball amazing! You were easily one of the highlights of the ball, and everyone loved your magic and were genuinely amazed! I think everyone loved your charm as well as your magic, and you left people astonished, with everyone still questioning how you did your various tricks! Thank you again for your ideas, with the close up magic during dinner, instead of the show, due to our guests and running over of the times we originally set out for them to arrive! I would definitely book you again, and would recommend anyone reading this do definitely book you if they are looking to hire a magician, as you were a steal at the price given! I am SO pleased to say that last night, in front of an invited lay audience, fellow magicians and a magical judge, I won the annual Leicester Magic Circle Close Up Competition, and can now proudly display the Roy Johnson Shield on my sideboard at home! Amazing considering I nearly killed the magical judge with a coconut (don't ask!) but a fantastic night and an achievement I'm really proud of! If you're considering hiring a band for your wedding, party or corporate event then I would highly recommend taking a look at wedrock, an indie, rock and pop covers band from Leicestershire. I will be performing magic at this years Anna's Hope Charity ball, to help raise money for this wonderful charity. Anna's Hope aims to help children and young people who have been diagnosed with brain tumours, as well as helping fund research into the causes, treatment and ultimately a cure. Please take a look at their website, Anna's Hope, and if you can do anything to help, or would like to make a donation, then please do so! Throughout the year I always try and offer my services to charitable functions, worthwhile causes and sponsored events. My chosen charity for this year is Wishes 4 Kids, a fantastic Leicester based charity that aims to grant a wish to terminally ill and life limited children. We just wanted to drop you a short note to thank you for your fantastic performance last Wednesday evening at Tanya’s birthday party. The close up magic was absolutely amazing and will be talked about for many years to come. It was the perfect start to a wonderful evening. Well what a crazy time December has been so far! Weddings, Corporate events and Christmas Parties every weekend, and I've met some great people along the way! I'm looking forward to my last few bookings now, and then a nice long break over Christmas before the New Years rush begins! I'd like to take this opportunity to thank EVERYBODY that I've met this year, and wish you all a fantastic Christmas and New Year! We just wanted to say a massive thank you for the part you played at our wedding reception on 6th June. I know I contacted you at the last minute, but your help and advice was so valuable and you put my mind at ease as soon as you responded. It’s clear that you have a great ‘way with people’ as so many of our guests were impressed. I’d advise anyone to come to you for that little bit extra at their wedding as it really lightened things up, so thanks again! Just to say 'thank you' for entertaining us all last night....you were absolutely fantastic, and everyone was still commenting on your magic long after you'd left the party!!! I am so glad I booked you! I would definitely have you come along to perform at any future events!! Best magician I've seen in a very long time!! We wish you well and keep on entertaining us!!! Just a quick email to say thank you so much for making our wedding reception very special and interesting - you were the talk of the day! We were astounded, amazed and highly entertained. It made a very special day perfect! All the guests said how much they enjoyed your magic. Cain - tall slim blonde one that followed you around with his mouth open - just kept shaking his head all day saying 'I have no idea how he does that, do you know how he does that?' and Mike - not so tall stocky blonde one - said if he wins the lottery would you like to be his personal magician??!! Thanks again for your very entertaining act and your generosity - it was exactly right for our occasion and the age group of our guests! If you ever need a recommendation - which I am sure you won't! - don't hesitate to give our name and email! If you are looking at really pampering yourself before your big day, or just fancy treating yourself to a makeover before your party or special event, then why not have it done in the privacy of your own home, at a time convenient to you? Seeing as I'm in a sharing mood I thought I'd share another testimonial with you. I was booked to entertain guests at a James Bond theme wedding at the weekend, which was FANTASTIC! Everybody was in such a great mood, the weather was gorgeous, and I got to wear my dinner suit again!! Wow what an impression you created – you were absolutely fantastic!!! So many people were gobsmacked by your unbelievable tricks – the special James Bond one for us was superb!! Thanks again Carl, we will definitely like you to see you again at one of our other celebrations!! Just a note to thank you for being brilliant (as ordered) at my milestone birthday two weeks ago. We have just returned from Venice to find people still talking about your superb magic. You changed my party from mundane to very special, so thank you so much for that. Good luck with your career & I hope to send more work your way! Anybody looking to hire a wedding photographer for their big day should take a look at www.angelicgroup.com - specialists in contemporary and classic photography to create a perfect reminder of your special day. My diary is really beginning to fill up for Saturday weddings in 2009. Already I have been booked as a wedding magician in Leicester, Nottingham, Coventry, Birmingham, Derby, London, Leeds and Carlisle, so it looks like I'll be spending quite a bit of time in my car this summer!! As well as this I have been booked to perform close up magic at a number of birthday parties, corporate events and trade shows, so all in all it looks like it's going to be a busy year! I had a great night on Saturday performing close up magic at The Lord Mayor of Leicester's Valentines dinner, and I've got a busy few days of magic ahead, as it's the annual Blackpool Magic Convention this weekend, which attracts the top magicians from around the world. I'm really looking forward to it but don't expect to be getting much sleep! I'd just like to wish everybody that I've met or worked with over the past 12 months a very Happy New Year! Thank you all for your support and here's to a great 2009! I received an email yesterday inviting me to entertain corporate clients of Manchester United Football Club on Saturday December 6th. As a Leicester City fan it will be nice to go to a stadium like Old Trafford and actually come away feeling happy! I'm really looking forward to it and hoping to get plenty of photos to show on here! I always like recommending people who I have worked with in the past, and just recently I have performed at a couple of weddings organised by a company called Weddings by Lisa Marie. Lisa Marie is a wedding coordinator based in Costock, Leicestershire, and can offer a complete package to make your dream day a reality, from basic advice and guidance to arranging the whole wedding, from flowers to table decorations, cakes to, dare I say it.. magicians!! I just thought I'd let you know my new facebook group has now been launched! Click HERE to join up, and keep your eyes peeled for loads of new content (when I get round to it!!) Such as videos, more photos and a few extra special bits.. that I haven't even thought of yet! I'm getting quite good at this blog thing now.. it doesn't mean I've got anything interesting to say though!! I've just received a lovely email from a couple who booked me to perform magic at their wedding last month, which I thought I'd share with you..
Just a quick note to thank you so much for being our wedding magician on 13th September. The feedback from our guests has been fantastic and so many people are still talking about you and your magic even now! We will have no hesitation in recommending you in the future, and thank you for being such a brilliant part of our magical day. Hello! Me again! Well I've got a busy weekend of magic ahead of me, a 30th Birthday party on Friday night and a wedding on Saturday afternoon, but I'm really looking forward to both.. and to trying out a couple of new magic effects that I've been working on over the past few weeks! Ooohh.. exciting times!! I've also just received a nice email from the lady who booked me to entertain her colleagues a couple of weeks ago, an except of which is below..
Carl, I just wanted to let you know that we all really enjoyed your act last weekend. PS Where did the ****** and **** come from?!! No, she didn't swear, I've edited that out to avoid ruining the trick for anyone who hasn't seen it! My first proper blog entry!! What do I write?? Well I had a fantastic weekend, I was performing at the impressive Bosworth Hall on Saturday night, and had a great time meeting all the surgeons at their annual Gala Dinner. I even had the chance to visit Bosworth Battlefield in the afternoon. There's a plaque in the ground there that states 'King Richard III Fell Here'.. I can't say I was surprised, I nearly tripped over it myself. Sunday was spent entertaining the new intake of students to Leicester University, and I have to say there were some very worried looking faces amongst them! I hope it was the fact they were away from home for the first time and not the sight of me that did it! Well summer's nearly over (and what a day that was!) so I thought it was about time to start work on my blog! I'll try and update it as often as possible with random bits, but make no promises as to how often, for no other reason than I'm useless! I've got a busy weekend of magic ahead, working at a Gala Dinner tomorrow night, and then performing for 600 new students at Leicester University on Sunday and Monday night! God help me.... and them!! !